This giveaway has ended. Thanks to all that entered! Congrats to Susan!! It’s time to dance!! In 2 weeks E gets to go see YO GABBA GABBA LIVE! THERE’S A PARTY IN MY CITY, presented by Kia Motors, in Charlotte and we are beyond excited! Last year we had a blast! You can read my review of the 2010 tour here. Of course any time I get the chance to review anything YO GABBA GABBA related, I jump on it. I love the social lessons, songs, art, and uniqueness. GIVEAWAY: YO GABBA GABBA LIVE would love to give 1 lucky reader a special CD/DVD that is only available on the tour!! 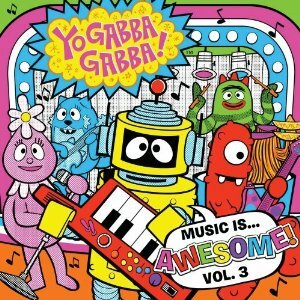 The CD is the Music Is Awesome Vol 3 disk (available on Amazon) but the DVD is a LIVE show at the L.A. Nokia Theatre which can only be purchased at YO GABBA GABBA LIVE. How to Enter: Tell me if YO GABBA GABBA LIVE is coming near you! Go Click on “Comments” to leave your post. Make sure to leave your email address!! I cannot contact the winner without it! EXTRA entries: You must complete the “How To Enter” before making any extra entries. Make sure you leave a comment for each extra entry and tell me which one.